Neil Heating and Air Conditioning Co. is the top company for heating and air conditioning in Minneapolis, MN. Owner Neil Olson and his crew provide heating and air conditioning sales and services to Minneapolis, MN and the St. Paul Suburbs. Our 35+ years of experience enables our firm to provide you with complete installation and service of residential, commercial, and industrial systems at competitive cost. We guarantee the lowest price! Established in 1976, our company goal has been to continue satisfying customers for many years to come. We service all makes and brands and guarantee the lowest prices. We can also work on many types of HVAC equipment, including air conditioners, heaters, furnaces, and boilers. We are a licensed air conditioning contractor so you can trust us to get the job done right. Our attention to detail allows us to provide you with the highest quality of service available. Call us now at 763-786-5530 and we will give you an absolutely free in-home estimate! Neil Heating and Air Conditioning Co. realizes times are rough, so ask about our many discounts. We offer military, contractor, landlord, senior, or handicap. We are licensed and bonded to perform work in Minneapolis, St. Paul, and the suburbs. We offer 7 major brands of heating and air conditioning equipment. Contact Neil Heating and Air Conditioning Co. today at 763-786-5530, or browse our website for more information about our products and services. Just wanted to thank you for going to bat for us with the warranty company and thanks to your installers (Jeremy) for the work done on our furnace. They were prompt and courteous and checked on their work the next day. You're a blessing this Thanksgiving and we will talk to you soon when we need air conditioning. 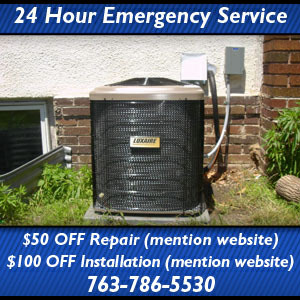 Wanted to say thank you for your prompt response for our air conditioner repair and then for the installation of the needed new air conditioner. Your follow through on this issue was very much appreciated. Your staff was courteous, professional and very informative. Thank you so much for answering my call today regarding our air conditioner! On Friday evening, my family returned home to find that our home was 85 degrees and not cooling. After some discouraging phone calls with our home warranty company on Saturday morning, I was feeling defeated and very discouraged knowing it was the weekend and worried about the 90 degree weather headed our way with two small children at home. So when you returned my voicemail and said you'd find someone from your team to come out today, I was so relieved and knew a prayer had been answered. Jeremy, one of your techs, reached out within just 10 minutes to say he could come and called just a short time later when he was en route. He quickly assessed the issue, clearly described it to us and made a short term fix to get us by until a new machine can be installed. We know that your company doesn't routinely work on Saturdays so we are so very grateful for your compassion for our young family and helping us on such short notice. We are looking forward to working with you to get a new air conditioning unit installed! Thanks again and have a nice night! Neil Heating and Air Conditioning did a great job with replacing our old central air unit. They were there when they said they’d be there, quick, and professional. the repair team were great. They knew what they were doing and helped restore our A/C to keep us cool when the temps were in the 90's.